Coming to Guruvayoor is like a spiritual calling for most Hindus. Guruvayoor holds a mesmerising appeal to everyone with the several temples and shrines that are scattered all over this small town, the most magnificent being undoubtedly, the great temple of Guruvayoorappan (Lord Krishna). Because of the sheer volume of devotees that pour in from all parts of India and abroad daily to visit this temple, real estate has been flourishing really well here. Many of the houses and flats bought in Guruvayoor are rented out by their owners on daily basis to pilgrims coming to this town for a day or two. Hotels have sprung up in Guruvayoor like mushrooms after the rain, and offer luxury rooms with all basic facilities and comforts. Most of the well-known hotels like Bhasuri Inn are centered around the temple premises, so that devotees can visit the temple on foot for attending the daily prayers and rituals. It is easy to find yourself a room for stay once you are in Guruvayoor, but a little exploring can strike you the best deal. If you are low on budget and traveling singly, renting a flat for a day would be the best option. Some provide the facility to self cook your meals too. For a group, you may consider a homestay or a hotel. There are several nice hotels in Guruvayoor to choose from. Bhasuri Inn – Rooms In Guruvayoor stands out from other hotels with its outstanding hospitality experience. Bhasuri Inn gives its guests the pleasure of easy booking through its website or mobile app, and regularly launches seasonal offers exclusively for its customers. The rooms and facilities are done up in international style, with a multi-cuisine restaurant, a coffee shop and a banquet hall to complete the picture. Many grand weddings have been solemnised in the banquet hall that can seat around 650 guests. 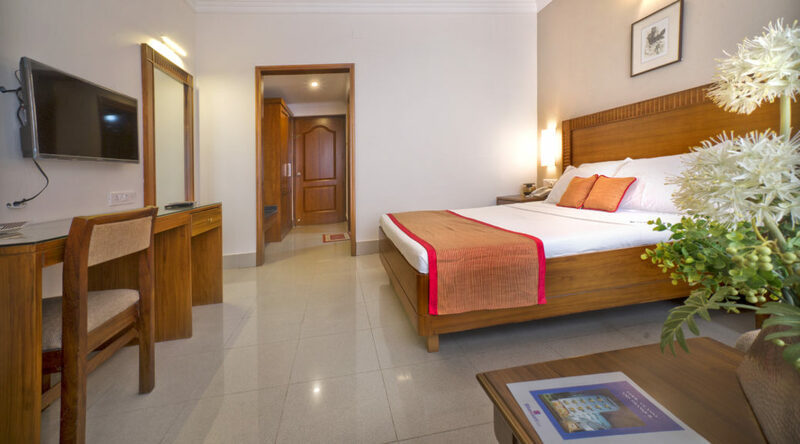 If you are planning to coming to Guruvayoor, it would be advisable to book rooms in advance, as Bhasuri Inn and other good hotels provide attractive discounts for advance booking. Bhasuri Inn – Rooms In Guruvayoor are available for a wide range of budgets and offer all the comforts of a pleasant, hassle-free stay. You also get updated information on the various places of interest in Guruvayoor and nearby areas from our front-desk or through our mobile app. If you are looking for a place to unwind and experience the divine atmosphere of Guruvayoor, there is no comfortable place like Bhasuri Inn. The warm, fresh atmosphere and friendly staff will make your stay a most memorable one.